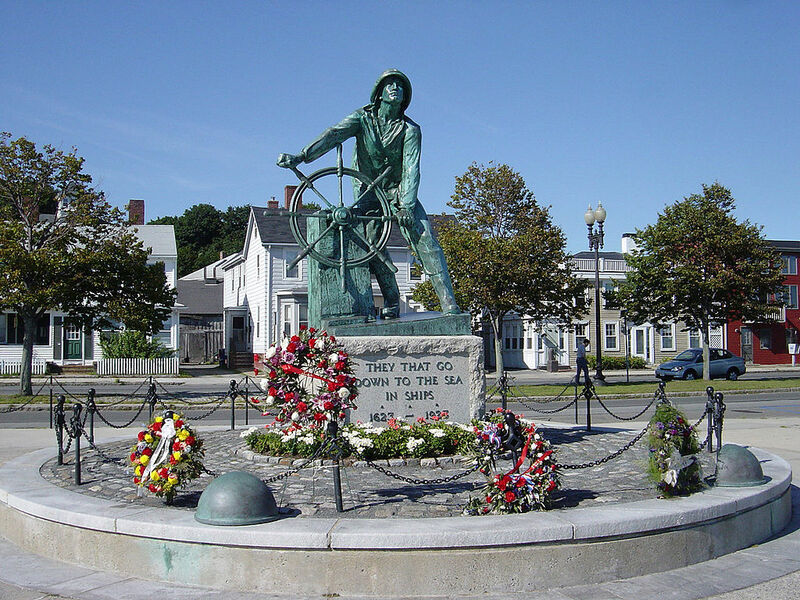 Five years ago I drove through the town of Gloucester, Massachusetts and saw the “Man at the Wheel” sculpture, a memorial to the many fishermen and ships who sailed from that port. It caused me to reflect on the relationships that existed between St. Jacques and Gloucester. There is the family connections of ancestors who moved to that legendary fishing port seeking employment and entrepreneurial opportunities they didn’t see in their Newfoundland future. There is also the connection between the fishermen of Fortune Bay who caught and sold their fish to such Gloucester companies as Gorton’s who operated a branch of their business in St. Jacques harbour over a hundred years ago. A third connection lies with the schooners from Gloucester who sailed to Fortune Bay in order to harvest herring during the winter fishery. During lunch at a restaurant facing onto Gloucester harbour I marveled at how small the port seemed in light of its massive historical reputation as one of the most successful fishing ports in North America. After lunch as we strolled along the pier and talked with Peter Souza whose grandmother, Emma Skinner, was born in St. Jacques. I tried to picture the schooners and their crews unloading their catch, processing fish and reconnecting with families and friends. At the same time I remembered that many of those men weren’t permanent residents of Gloucester. Hundreds of them still considered places like St. Jacques home, even though they spent most of their lives at sea and their shore time in rooming houses and shared accommodations in the Gloucester area. Sometimes they made it home for visits; sometimes their families lost contact and lost track of them. They simply became the relative who fished out of the ‘Boston States’ who never returned. Their final resting places were either at sea or in one of the many cemeteries in the region with little or no reference to their homes in Newfoundland or the other Atlantic provinces from whence they came. That afternoon’s experience lay dormant for a couple of years until one evening when I was reviewing a compilation of research notes I saw something that triggered a memory; a story supported by very little detail that I had heard from several sources, of a man who had frozen to death on a beach in St. Jacques harbour. They all agreed that he had been trying to get back aboard his vessel which was at anchor in the harbour. Details of the circumstances varied slightly. One suggested he may have been visiting someone on shore and waited until too late in the evening to return to his ship. Another thought that he may have been visiting Belleoram or English Harbour and had walked to St. Jacques, arriving tired and cold to find his shipmates had returned to the schooner without him; thus deciding he would wait until daybreak when he might hail someone aboard ship to send a dory to pick him up. A third story had him attending a dance in the local parish hall where he had been drinking and had passed out on the beach before reaching his dory. I was intrigued. I mentioned it to others who told me they too had heard the story, yet could offer no further information. Whenever I found a reference to visiting fishing schooners in St. Jacques harbour in the late nineteenth century I searched for any clue which might lead me to knowing more of the story. I hoped I might possibly learn the name of the man who went to sleep in the cold on the edge of an unforgiving ocean in the middle of winter to never awaken. I wondered who he was, where he was from, why he was there alone on the beach away from his schooner, who his family was, where they lived, and what happened to his body. I wondered how old he was and whether or not he had children whom he would never again tuck in at night or if he was single and lived alone. Reading that short note renewed my interest in this man whose life ended on an ice-covered pebbled beach that fronts St. Jacques Barachoix and started me searching again for information. Grandfather, who was born in 1900, had told me the event occurred “before his time”, meaning prior to his birth. My intuition suggested that he might have been a sailor on an American schooner, perhaps out of the New England region since many of these ships visited St. Jacques and other communities in Fortune Bay during the half-century prior to his birth, in pursuit of the lucrative herring. 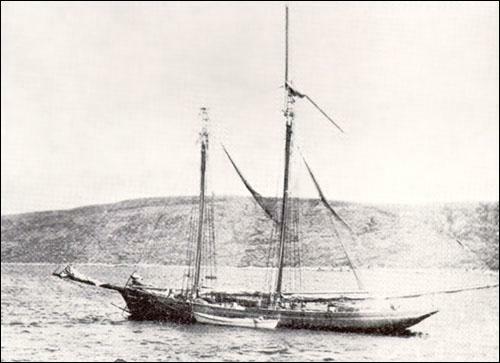 A schooner from Massachusetts off the coast of Newfoundland. During the 19th century the Americans were keenly interested in the Newfoundland fishery in general. Both the United States and Newfoundland promoted a more formal relationship between them. However, access to fish was controlled by Britain since Newfoundland was a colony of that country. In 1871 Britain and the Unites States signed the Treaty of Washington which gave American fishermen better access to Canadian fish resources in exchange for more open access to American markets for Canadian goods. In 1873 Newfoundland became party to that treaty. Under it, certain Newfoundland exports received free entry into the American market in exchange for greater access to Newfoundland fish stocks, primarily herring. According to Hillier (2002) “American fishermen took advantage of the treaty to develop a winter trade in frozen herring along the south (and later the west) coast, and frequently visited Newfoundland ports to purchase bait and other supplies.” This was the time period I started looking at in hopes of finding some trace for the unfortunate soul whose fishing career ended far from home on what in the summer time is one of the most pleasant of beaches, yet in winter is awash with water that can leave a coating of ice on footwear in seconds. I again recalled my conversation with Peter Souza on the harbour front in Gloucester where he also told me about his efforts to restore the schooner Adventure, a project he had at that time been working on for years. He spoke of his Newfoundland and Portuguese family roots as he recounted the generations of fishermen from both countries who fished out of Gloucester, many of them sailing to Fortune Bay on schooners like The Adventure. I wondered if the mystery sailor might be one of those men. That discovery left me speechless. Nearly forty years of wondering who this man was had come to an end. I now knew his name and the name of the schooner from which he fished. Further research showed that the Schooner Hattie L. Newman was of 98.34 tons and sailed from the home port of Beverley, Massachusetts. The vessel was built in Newburyport in 1875 by Daniel Allen and Son of that town. A local Massachusetts fisheries report issued in 1882 told me that the Hattie L. Newman had arrived from Greenland September 18, 1882 with 100,000 pounds of flitched (steak cut) halibut and with 100,000 pounds of salt cod caught on the Flemish Cap before going to Greenland. It is likely that next trip of the Hattie L. Newman was northward again, for another catch of cod before making a winter voyage to Fortune Bay to secure a load of frozen herring. Though I now knew it was Michael Brien who never made it back aboard ship on that January night in 1883, a question of why he didn’t make it still nagged at me. This feeling led to further searching which gave me the following story shared by a contributor on RootsWeb, apparently quoted from the book, Lone Voyager: The Extraordinary Adventures of Howard Blackburn Hero Fisherman of Gloucester by Joseph E. Garland. Published by Little, Brown and Company, Boston and Toronto, 1963. Mr. Michael Brien, one of the crew of schooner Hattie L. Newman of this port (Gloucester), died at St. Jacques, Newfoundland, January 16, from the effects of exposure. He had been on a visit to the schooner Woods, and while returning to his own vessel in a dory became chilled, was driven ashore and perished on the beach. The schooner “Woods” is likely the Henry N. Woods built in 1882 in Boothbay, Maine for George Norward and Son. She was known as part of the Gloucester Fleet that fished for herring and mackerel in the north Atlantic. Michael Brien was probably rowing a dory across St. Jacques harbour under siege from January winds in the dark; fatigued after days of hard physical labour, cold and chilled to the bone as he forced every ounce of strength into the next stroke of his oars when he realized he wasn’t going to reach the Hattie L. Newman under his own steam. It is also probable that he made for shore hoping to find shelter until the light of morning when he would resume his trip. We know he didn’t find the shelter he was seeking nor did he reach his schooner alive. The name Michael Brien resonated in my head for several hours until I recalled a tombstone I had photographed in the St. Jacques Roman Catholic Cemetery years earlier. A quick scan through those images told me the next part of the story. There, amidst the bushes and grasses of the cemetery overlooking St. Jacques Barachoix beach was a marble slab marking the grave of Michael Brien. There is a date discrepancy here of the twelfth and sixteenth as reported in Gloucester. That is likely an issue of communication. When one question is answered another question appears. The question which emerges next is who is Captain Jas, McDonald and why did he pay the cost of erecting a tombstone to Michael Brien. Was he the Captain of the Hattie L. Newman? 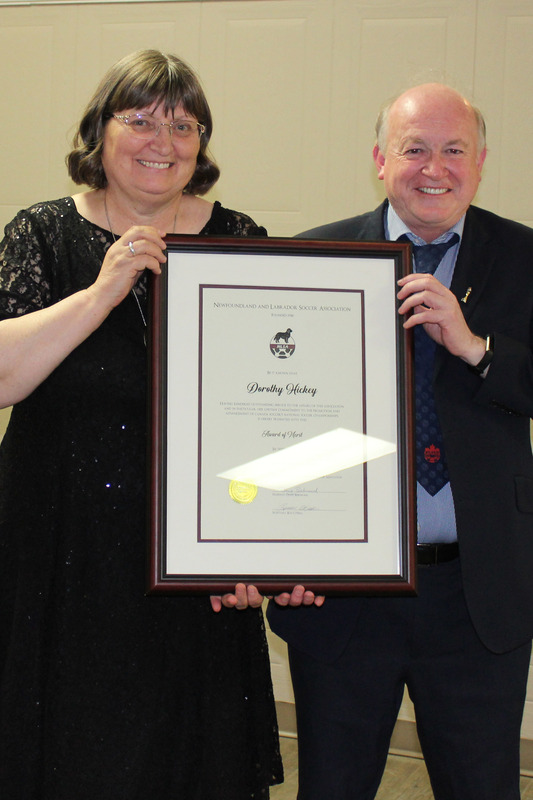 Was he a fellow Prince Edward Islander? I have been unable to determine this. Though McDonald was a name found in various communities along the south coast of Newfoundland historically it was not a name that has much legacy in St. Jacques. There are two other references to the McDonald name around that time. Another tombstone in the Roman Catholic cemetery bears the name of Captain John McDonald who died January 17th, 1883, aged 39 years. The stone bears no information of who erected it or the origin of Captain John McDonald. Church records for St. Bernard’s Parish, Fortune Bay, which maintained records for St. Jacques, 1874-1877, shows a Captain Hill McDonald who married Ellen Burke of St. Jacques. Are these McDonald’s connected? The name has disappeared from oral history in the community. It is intriguing how one question leads to another then another; how the answer to the first question raises many other questions. Such is life; such is any attempt to uncover information of events which occurred before one’s time. In this instance Michael Brien died 131 years ago, as of this writing, and he has gone from being known by his contemporaries to being forgotten over time in the community of St. Jacques. Yet, like all mysteries and unexplained events, somewhere there exists information to pull away the cloak of not knowing. Even when we do so, we are often left with more of which we have no knowledge. Toil-worn hands on nerveless breast. And red suns go to the west. On the flakes where the fish are dried. The flurries white and blind. In dread and hunger he sailed and steered. Since the farthest cape was cleared. The green tide has its way. How the white spume hisses thin. And the doomed brig’s agony. Buried so soft and deep! The article Newfoundlanders in the “Boston States”: A Study in Early Twentieth-Century Community and Counterpoint, by W. G. Reeves, published in the Journal of Newfoundland and Labrador Studies Vol 6, No 1 (1990), provides a good background to the relationship between Newfoundlanders and the Boston States. A very touching story. Love your site and look forward to reading each post as it keeps me in touch with home. But must admit sometime it makes me want to pack my bag and head to St. Jacques for a couple of days.